» Josh Reviews an Extraordinary Fan-Edit/Reconstruction of The Empire Strikes Back! Josh Reviews an Extraordinary Fan-Edit/Reconstruction of The Empire Strikes Back! Back in 2009, I watched and fell in love with the fan-edit of the original Star Wars created by a Star Wars fan known on-line as Adywan. This fan-made version, called Star Wars: Revisited, blew me away. It is at once a restoration, stripping away some of the dumber changes made by George Lucas’ frequent tinkering with the film (such as Greedo shooting first at Han) as well as correcting errors that have crept into subsequent home video releases of the film (mistakes with the audio, color-timing, etc.) while also adding in lots of fun new changes that represent what the “Special Editions” should have been (incredible enhancements to the Battle of Yavin, adding a junked battle droid into the Jawa’s crawler, showing Ponda Baba’s arm as cauterized rather than bloody after Obi-Wan slices it off with his lightsaber, giving Chewie a medal at the end, and lots more). Adywan’s Star Wars: Revisited immediately became my preferred version of the film. In all the years since, whenever I’ve felt like watching Star Wars, this has been the version I have watched. It’s that amazing. (Click here for my full review.) That one fan, working on his own, could outdo George Lucas and all of Lucasfilm and ILM is extraordinary. Absolutely extraordinary. In the years since, Adywan has teased fans with glimpses into his work on a similar reworking of The Empire Strikes Back, but at times I feared he would never complete the project. The long wait is over, though, and a few weeks ago Adywan finally released The Empire Strikes Back: Revisited. It is incredible. Time will tell whether this becomes the only version of Empire that I watch from here on out the way Adywan’s Star Wars: Revisited has become the only way I watch Star Wars, but after this first viewing I am definitely leaning in that direction…! The Empire Strikes Back was the Star Wars film least damaged by the Special Editions and all the subsequent tinkering with the film. Actually, I love pretty much all of the changes/updates made to the film during the 1997 “Special Editions” (with the exception of the girly-man scream given to Luke when he falls down the shaft in Cloud City). Rather, it’s the subsequent changes made for the 2004 DVD and 2011 blu-ray releases that burn me. I have a friend who is a HUGE Star Wars fan who told me he’d never seen Empire with Boba Fett’s original voice, and that broke my heart! (For the 2004 DVD release, Boba Fett’s dialogue was all redone by Temuera Morrison, who played Jango Fett in Attack of the Clones. This makes continuity sense, since that film revealed that Boba was a clone of Jango, and so he would grow up to be the same person, with the same voice. But I sorely missed the original voice. Without ever seeing Fett’s face, his character was fully realized by his look and his voice, and altering his voice damaged the character in my opinion.) The 2004 DVD added another big change that, as with Fett, made continuity sense but was executed poorly. This was the replacement of the voice and face of the Emperor, as glimpsed via hologram in conversation with Darth Vader, with Ian McDiarmid who played the Emperor in Return of the Jedi and all of the prequels. In the original version of Empire, the Emperor in that one scene was played by Marjorie Eaton and voiced by Clive Revill. Now, I love the idea of replacing the Emperor with the actor who played the character in all the other films! But the redone effect looked terrible. The Emperor was over-lit and fat-looking. (Click here to see a comparison shot of the original Emperor and the bad-looking 2004 replacement.) I found it painful to watch Empire these days and have to watch it with these and other unsuccessful changes. Thankfully, Adywan’s new edit corrects all that!!! First, Adywan removes the most egregious changes made to the film over the years. Boba Fett’s redone voice is removed and the original voice restored. The afore-mentioned bad-looking Emperor hologram is gone. Adywan has also made a number of nearly invisible adjustments to the film in order to correct small gaffes and continuity errors that eagle-eyed Star Wars fans have noticed over the years. For example, on Hoth, when Han and Chewie face off with the probe droid, the droid now fires directly at Chewie instead of in a random direction. There has been a lot of futzing around with the backgrounds and positioning of characters on the Executor (Vader’s super star destroyer) so that characters are in the correct spots and looking out the right windows to see the things they should be seeing. Now, I am a huge Star Wars fan and I have probably seen Empire fifty times, and I never noticed any problems with the backgrounds or positioning of characters on the Executor before. But it’s cool that Adywan has found and corrected these small errors, and very impressive that he has been able to do this so seamlessly that you’d never know that backgrounds have been changed, colors adjusted, etc. * During the assault on Hoth sequence, Adwyan has added in additional AT-AT walkers, and also a number of smaller AT-STs (originally only seen on Endor in Return of the Jedi), thus showing that the Empire landed on Hoth with a far more impressive assault group, leaving the Rebels even more outmatched. These shots make sense story-wise (of course Vader would land with an overwhelming force!) and the new shots look absolutely perfect; you’ll think those additional walkers were always there. * I mentioned the Emperor hologram above. Adywan has miraculously created the best possible version of the sequence. He kept Ian McDiarmid’s line readings, recorded for the blu-ray release, but has adjusted the hologram to look much more shadowy and menacing. 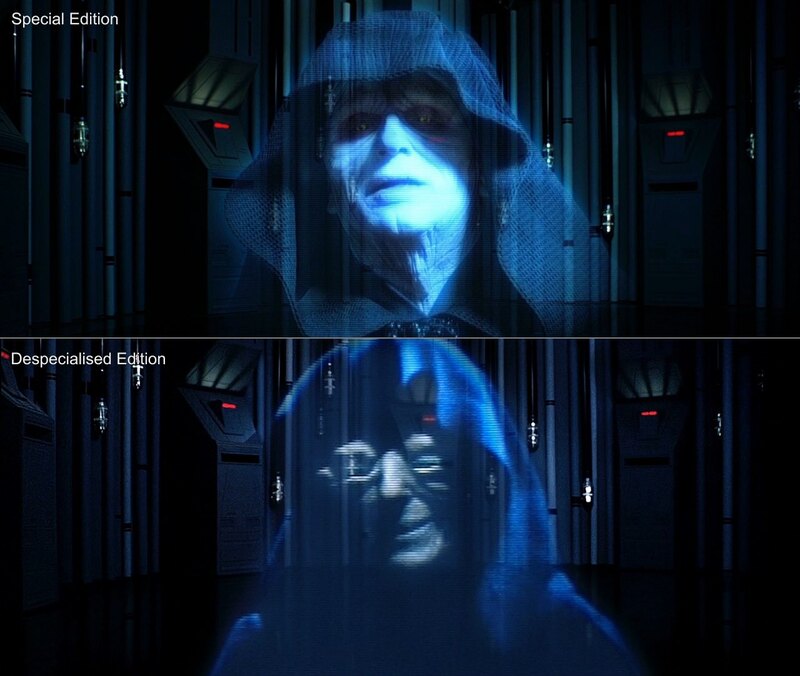 The hologram is now clearly Ian McDiarmid’s face, but adjusted to look 100% better and far more like the hologram looked in the original version of Empire. It is a perfect compromise. Take a look at the screencap at the top of this article. It is spectacular. * Adywan has made a number of tweaks to the Wampa sequence, deleting all but one of the additional shots of the creature added in for the Special Edition, and creating a shot all his own for when the Wampa first attacks Luke. I was never bothered by the Special Edition version of the Wampa, but Adywan’s version looks great. My favorite change, though, is that Adywan corrected the problem of Luke’s legs being spread apart in the long shots of his being suspended upside down, even though his legs were clearly much closer together in the close-up shots when he is trying to free his legs. Now, Luke’s legs are together in the long-shots too. * On Dagobah, Adywan has replaced the stop-motion bogwings with CGI ones that look perfect and move much more smoothly — and he has added some additional awesome looking weird creatures, too! * I don’t know how he did it, but Adywan has smoothed out the stop-motion animation of the Tauntauns. He has preserved the “look” of the Tauntauns but somehow made their motion far more smooth and natural. * When we see Luke about to leave Hoth in his X-Wing, there is an awesome glimpse of one of the huge Rebel transports lifting off in the background. * When Yoda (pretending not to be Yoda) takes a bite out of Luke’s snack stick on Dagobah, you now see an actual bite taken out of the stick! That was one of my favorite little changes!! * In the Dark Side cave sequence, when the false Vader’s helmet explodes, you now see a much more naturalistic image of Mark Hamill’s face inside the helmet, rather than a dummy head. It makes the sequence MUCH clearer because in the original version it wasn’t immediately obvious that Luke was seeing his own face. * One of the most famous mistakes in Empire was that the prop of Han frozen in Carbonite showed Han wearing the style of shirt he wore in Star Wars, rather than the shirt he was wearing in Empire! Somehow, magically, Adywan has adjusted all shots of Han in Carbonite so that now the frozen Han’s shirt is correct!! It’s amazing! There are so many more wonderful little adjustments that I have not listed. IG-88 (the bounty hunter droid) now moves its head. There are cool display screens added into the snowspeeder cockpits. When we see Boba Fett’s ship Slave I on the landing pad of Cloud City, the cockpit is now translucent as seen in the space shots. After Lando announces the evacuation of Cloud City, we can see ships leaving. And so much more. There was really only one change made to the movie that I didn’t like. Adywan changed the color of the bacta tank (in which Luke recuperates on Hoth) from blue to red. I have read that Adywan did this because that was the original plan, only the coloring didn’t wind up working on set. But at this point, so many decades later, the blue color of the bacta tank feels very canonical to me, and now seeing it be red feels wrong. My only other complaint is that in the version I watched, there were a few instances in which the audio was slightly imbalanced, with a few lines of dialogue being way too quiet. I am not certain if this is a mistake in Adywan’s original file or something that happened on my end when downloading and burning this to DVD. I need to look into this a little more. For more information on The Empire Strikes Back: Revisited, click here. Click here for a complete list of the hundreds of changes Adywan made to the film. For information on where to find Adywan’s version, click here. Please be aware that Adywan asks that you own a purchased copy of The Empire Strikes Back before downloading or streaming his version. The almost decade-long wait has been worth it. What this one Star Wars fan has achieved is mindblowing. This is a near-perfect version of the film. It is arguably the best way to watch The Empire Strikes Back at this point in time. I am in awe. Thank you, Adywan… and I hope we don’t have to wait another decade for Return of the Jedi: Revisited…!! !